Anna Halprin, 2016, Kentfield, CA. Photo: Sarah Beckstrom. 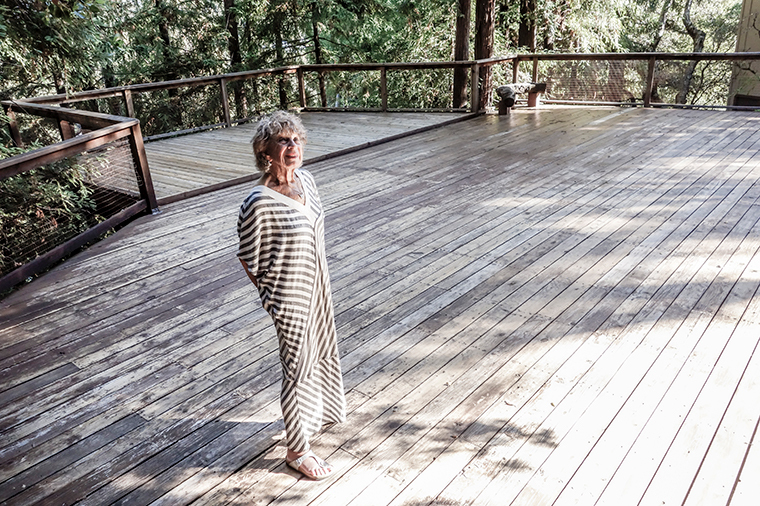 Envisioned as a closing ceremony for Fritz Haeg's California RSVP Workshop, Anna Halprin hosts a food and movement ritual on the storied dance deck at her home in Kentfield, California. Consisting of a movement session, an awareness walk, a ritual procession, and a ceremonial meal, the event marks the end of Haeg's workshop organized in the spirit of Anna and Lawrence Halprins' collaborative workshops of the late 1960s. Taking place at the same site that was used so often in the couple's workshops, the event draws together a cross disciplinary and multi-generational group of artists, architects, designers, dancers, and chefs. The program considers the legacy and impact of the Halprins and the precedents they established in group collaboration and creativity via open scoring, environmental and interpersonal awareness, and drawing and building exercises. Anna Halprin (b. 1920) is a dancer, choreographer, and pioneer of avant-garde dance. She founded the San Francisco Dancer's Workshop in 1955 and the Tamalpa Institute in 1978. Halprin has created 150 full-length performance works, including Trance Dance, City Dance (1965–78); Parades and Changes (1965–67); Circle the Earth (1981); and Planetary Dance: A Call for Peace (1987). She is the author of three books on her own work and contributed to Taking Part: A Workshop Approach to Collective Creativity (1975) and The RSVP Cycles: Creative Processes in the Human Environment (1969). She was awarded a Guggenheim Fellowship for Creative Arts (1970); the Samuel H. Scripps/American Dance Festival’s Lifetime Achievement Award (1997); a National Endowment for the Arts “American Masterpieces” award (2008); and the Doris Duke Impact Award (2014), among others. Halprin’s work was included in the 2011 exhibition West of Center: Art and the Countercultural Experiment, 1965–1977 at the Museum of Contemporary Art, Denver. In 2014, she performed Festival d’Automne à Paris at the Centre Pompidou, Paris. Her work is included in the collections of the San Francisco Museum of Modern Art and the Museum of Performance and Design.